Why did you become a researcher? For sure, there are as many different (and good) reasons as people you ask. However, when confronting some students, friends or colleagues of mine with this question, I can see a number of recurrent answers. 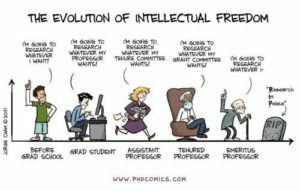 One of them is “because I love the intellectual freedom research can give”. I tend to agree, yes, but we all know there exist some ‘constraints’, right?